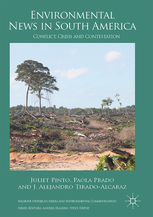 Combining perspectives from media studies and political ecology, this book analyses socially constructed news regarding three environmental conflicts in South America. In recent decades, South American political administrations have tied national economies to neo-extractive development strategies, creating not only vulnerabilities to global commodity boom and bust pricing cycles, but also to conflict regarding environmental and cultural degradation from extraction activities. Environmental contestations among indigenous peoples, environmental and social NGOs, state actors, and extraction industries receive media attention, but how these disputes are covered has implications for understandings of media performance in democratizing nations. The authors examine three case studies of environmental contestation in a region that is simultaneously vulnerable to the effects of climate change, and yet has become once again dependent on commodity exportation to industrializing and industrialized nations for economic benefit and social development strategies. Paola Prado is Associate Professor of Journalism and Digital Media in the Communication Department at Roger Williams University, Rhode Island, USA, and a IAMCR member.